It’s a new year and with it comes the proverbial clean slate – new goals, new opportunities. Exciting, right? But the truth is that many times the goals we set for ourselves and others are not reached. Why not? Is it that we lose focus, feel overwhelmed, give up? For one reason or another, goals can be daunting, cumbersome and hard to achieve. But they don’t have to be. Armed with the right strategy you can meet your goals, lead your team to achieve theirs and enjoy all the rewards that follow. Here are seven things you can do that will empower you to help your employees reach their goals and take your business to the next level. The main way to keep everyone – from executives to entry-level employees – focused on their goals throughout the year is to reinforce the big picture. How does each goal contribute to the organization? Why is this specific goal important in the bigger scheme of things? How will everyone benefit from accomplishing this goal? Effective leaders keep the emphasis on why the goal makes a difference to the company as a whole. Specific goals are fine, but don’t lose sight of the bigger purpose. Passionate people are driven by a cause, a purpose and a belief. Leaders who start with the why inspire those around them to take action. Keep it on the why. When you do, everybody wins. Meet with employees on a regular basis to see how they are doing. Do they have any problems? Are they on track? Hold monthly team meetings and keep everyone updated. Encourage participation by making sure the meetings are focused, relevant and engaging. Don’t wait until the last minute to check in. If things are not where they need to be, don’t sugarcoat it. Be open and honest. If goals change, don’t wait to communicate. It is important to tell your team what has changed and why. People appreciate transparency. If the goals are not on target, ask for feedback on how to get back on track. Mistakes will happen. Instead of focusing on the problem, ask for participation toward a solution. Goal-setting doesn’t have to be burdensome. Team activities can help foster a positive attitude and keep the momentum going. The use of illustrations, charts and diagrams that show progress toward the goal creates a fun atmosphere that helps keep people focused and creates buy-in. Keep their interest. A common way to track a goal is with a large cardboard thermometer, where participants color in the thermometer from the bottom up to the top as they near goal achievement. The goal is written at the top and may be tracked in increments such as dollars, hours, accolades. Customize it for your own organization. The idea is to start with a blank thermometer and color it in as the goal looms in sight. Keep it fun. It doesn’t have to be a grind. Goals can fail because they seem overwhelming. Mentally, it is easier to achieve goals if they are broken down into smaller pieces. Successful people look at a goal and work backward. Look at what your goals are for the month, not the year. It’s like running a marathon. You don’t start out by saying you are going to run 26 miles and see how it goes. You set goals in increments – by spring I will run five miles, by summer 10 miles, etc. Take baby steps to reach your goals. You are more likely to reach the finish line. If you are trying to accomplish too much at once, you’re going to miss something. It’s quality not quantity that counts in achieving your goals. If you focus on one part of the goal at a time you will be better off in the long run. Take your time and give each task the attention it deserves. Stop multitasking. How? Have a short to-do list, pick your top three to five priorities for the day and write them down. Don’t robo-check your email. Have regular times when you read and reply to messages, and resist the urge to respond to the email pings that alert you day and night. Book meetings for less time than you think they will take. People tend to get to the meat of the matter and wrap up points quicker when there is less time. What is happening now? What is the effect of this? Have you already taken steps toward your goal? Does this goal conflict with any other goals? What could stop you from moving forward? How will you overcome this? When do you need to review progress? Daily, monthly, weekly? By making it their plan they will be more apt to take ownership in it, be more accountable and more focused. When they have a stake in it they will be more likely to experience success. Involve your team and their expertise – they have much to offer. Don’t wait until the entire goal is completed to celebrate successes. Each milestone is an accomplishment. Stop and congratulate everyone for their work and contributions along the way. Offer encouragement and positive reinforcement. Focus on the good that will come when the goal is realized – instead of the negative results if it isn’t. Rewarding small victories nurtures the path to completion. When you inspire your employees to reach their goals and provide them with a fine-tuned strategy for success your business will thrive. 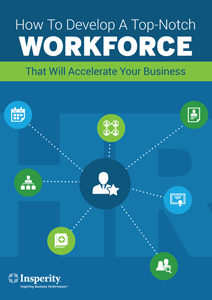 Download our guide How to Develop a Top-notch Workforce That Will Accelerate Your Business, today.